I found this print whilst rummaging through some old photographs and papers earlier this week. 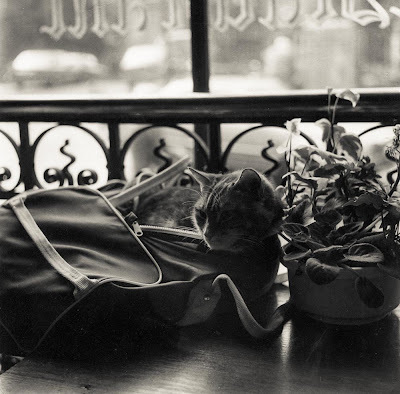 I took it about 33 years ago in a pub in Amsterdam. 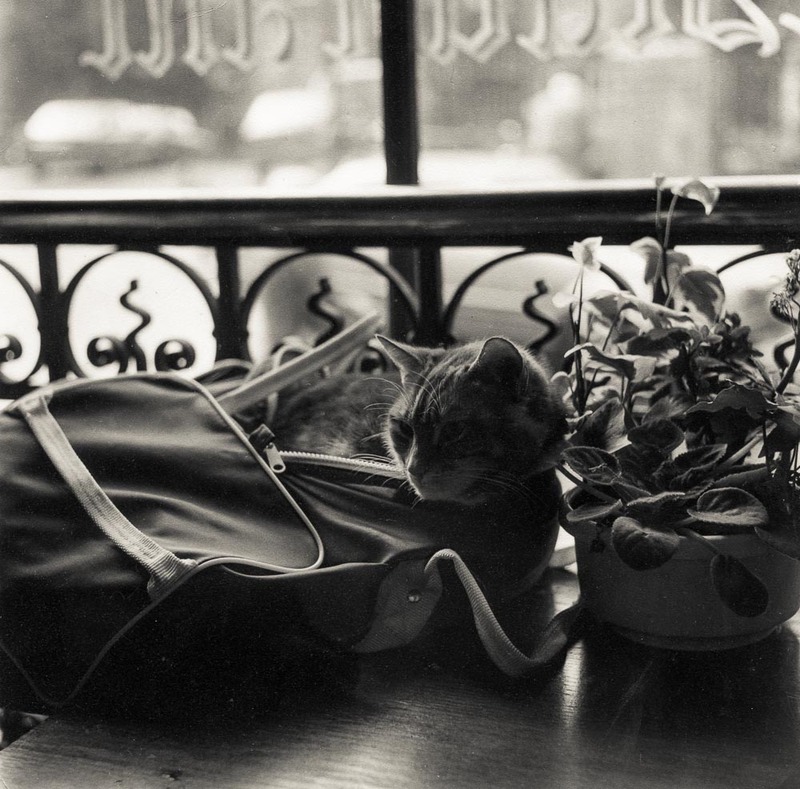 The cat must have lived in the pub and it decided that my holdall looked comfortable so climbed in for a sleep. It's a scan of a lovely 8x8 inch print but, sadly, I've lost the negative. It was a Rolleiflex picture shot on colour negative film. I've got a couple of rolls of colour negs from that trip but I've no idea at all what happened to this particular frame. I'm a bit gutted to be honest as I love this pic. The print wasn't processed as thoroughly as it should have been and it's taken on a slight sepia tone. The colour is actually very nice but I should really wash and re-fix it to stop it deteriorating any further. I thought I'd scan it and post it here for posterity. I was using colour neg film because it was easy to put it through the colour processor in the photo lab at the newspaper I worked for. I've got a feeling I might have made the print in the darkroom there and that's maybe when the negative went missing as I can't ever remember seeing it at home. Here's another scan from the same trip but this one doesn't exist as a print. 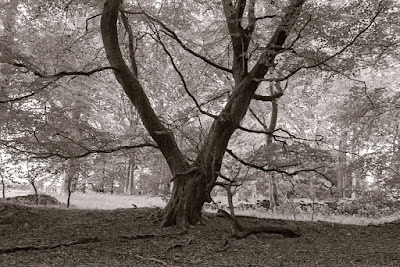 In fact, it doesn't even exist as a single negative as it's two Rollei negs joined together in Photoshop. Stuck with just the TLR's 80mm lens, I couldn't get everything in so I took a shot down the left bank and then one down the right bank. This was before computers and Photohop but, with uncanny foresight, I reckoned that one day someone would invent the software to realise my vision*. Nice shots. So the cat shot is a b&w print from a colour neg? For years I've always heard that it doesn't work but recently I've been seeing people prove that theory wrong. Love the canal shot Bruce , I am a big fan of '6x12'. I think the 6x12 using a standard lens makes me as the viewer of the image feel as if I am standing on that very spot looking down the canal. Maybe its the closest to our natural vision. I know we see a wider angle with our eyes but how much is registered in sharp focus. My old Rolliecord manual demonstrates how to use scissors and cow gum to stitch images a skill beyond me who often requires medical assistance after cutting my own toenails...photoshop is essential. 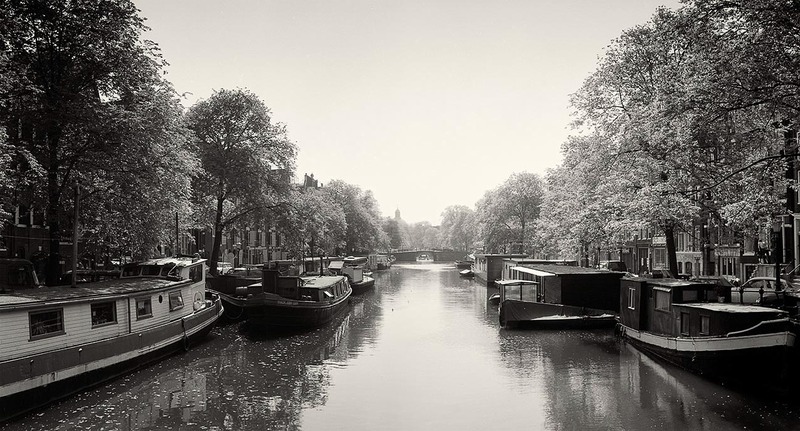 I tried combining two darkroom prints of the canal a while back and the biggest problem was matching sky tones. I think it would be possible to get an acceptable result but it wouldn't be perfect as with Photoshop. Would that necessarily be a bad thing? It's easy doing black and white prints from colour negs although some of the tones might reproduce lighter or darker than you'd expect and contrast tends to be lower so you need a harder grade. Other than that, it's just the same as using black and white negs.